What do Evangelical Leaders Believe? One of the things that is consistently overlooked in the discussion of “religion in school” is how important it is to one narrow subgroup of Christians: Evangelical Protestants. You won’t hear Australian Greek Orthodox leaders clamoring for a go at preps. Why? They run “Greek schools”, where Greek families send their kids, AFTER SCHOOL to engage in their traditions and forms of worship. The group however that is most activist in threatening our society, and the group who has chosen to be the most hostile to our traditions of secular democratic values? Evangelical Protestants. Who is the Chairman of ACCESS Ministry? An Evangelical activist. Who is the CEO of ACCESS? An Evangelical activist. How do we know this? They openly admit it. and serve on the organizing group for the a worldwide evangelical movement called “The Lausanne Covenant”. To most people this is meaningless. So what? Please read the summary or the report if you’re interested in getting a snapshot into this subset of Christian thinking. The troubling thing is that the leaders of our schools don’t seem to pay any attention to just how incompatible this group is with the basic ideals of our society and of our education system. How do we know this? They tell us! The first thing to notice about Evangelical activists is that it is “us and them” all the way down. If you aren’t part of their group, they don’t look very favorably on you, what is the dividing line in their world view? You guessed it, the bible, so Buddhists, Hindus, Muslims, and people who don’t believe in God … pretty much get looked down on. Take heart you Buddhists, you live in a “secular society” where you are equal under the law! The second thing to realize about Evangelical leaders is that their opinions tend not to be “their opinions”, 60% believe God reveals things to them, and 40% believe they are prophets. This should be enough to warrant NOT hiring evangelical leaders to run school programs, but wait, it gets worse, close to 60% believe that people can be possessed by evil spirits. Folks this kind of thing has no basis in reality. 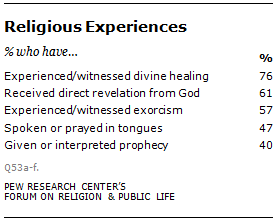 People are not “possessed by evil spirits”, these are views of the dark ages, of backward tribes or of cults. If someone’s eyes roll back in their head and they convulse on the floor, this means they need a doctor, not an exorcist. What do they believe is a “threat” ? The number one thing is “secularism” … far from having a positive view of this core part of our system of laws, 71% say it is a major threat. Got that? 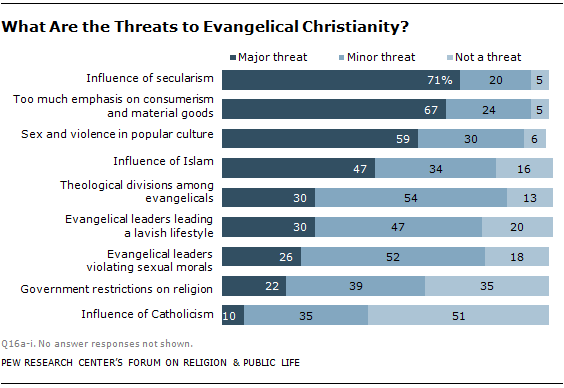 Instead of being the source of their freedom to worship as they choose, “secularism” is held as a “major threat”. It is important to keep in mind that a core tradition of Australian Society, and of our education system is “secularism”. These same people propose to be given ACCESS to teach “values”. What kind of value system views secularism, as a threat? Former High Court Justice, Michael Kirby recently wrote that the invention of secular traditions within the British system of law, is probably the single most important advance in the development of human rights in all of history. So much for teaching our kids values or traditions! While it is great to see that Catholics no longer rank as a leading threat, what is really sad to see is what is NOT on this list: ignorance and illiteracy, seemingly pose no threat. 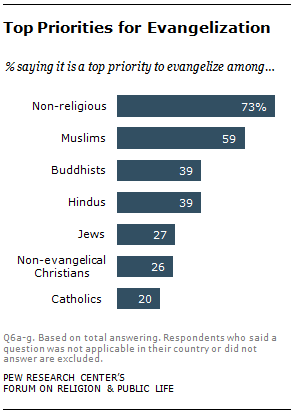 Lastly, who do evangelical leaders most want to evangelize? 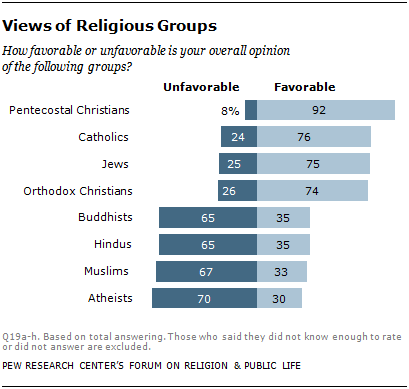 Not surprisingly, they want to evangelize people who are “not religious”, seconded only by people whom they wish to convert from their current religion … this is not good news for families in Australia who wish to raise their children without religious teachings or in a faith tradition other than the one they believe is the only way to “know God”. What does this mean in practice in our schools? It means you must opt out to avoid THEM, because in our public school … evangelical leaders have lobbied to put a policy in place to pursue their agenda. Great research, very insightful – and scarey! The standard government and school response to complaints about R.I. and Chaplains is that they are not about forcing religion on anyone. This article shows that that is precisely what is going on.